I stopped on my way home to order Chinese takeout for dinner the other night. Usually I spend the brief wait time on my cell phone, catching up on email and the next day’s weather forecast. Not this time. Instead, I headed outside, crossed the road and circled a nearby church parking lot as fast I could walk for 12 minutes. It was dark and a little chilly and possibly not as well lit as ideal safety would dictate, but boy, did it feel good. Because … steps. Besides being a lot of fun and burning off some stubborn calories that mysteriously glommed onto my midsection after — not during — the holidays, I’ve learned a lot from this challenge. Some of these are more like duh-huhs but apparently I needed reminding. Being on a team working toward a goal together is both fun and motivating. All the gals in my group were already very active, but none of us wanted to be the “anchor” holding the team back. So we all kicked it up a notch, adding second daily workouts, joining neighborhood walking clubs and obsessively carrying our phones or smart watches to track every possible step. 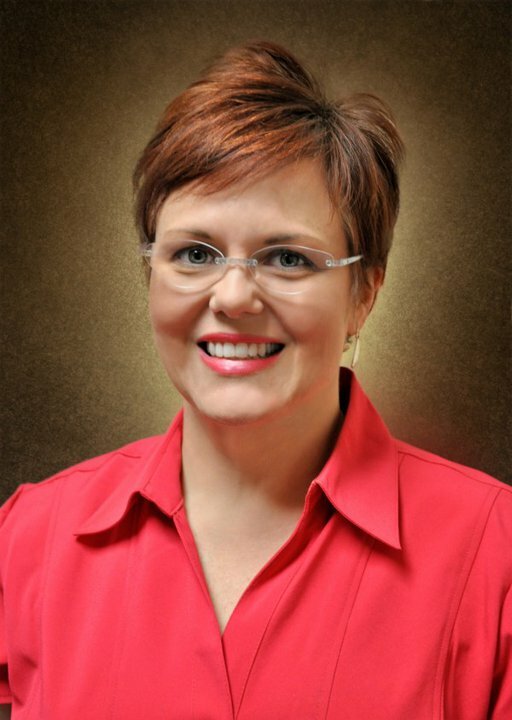 When one team member fell victim to the flu, the healthy ones had her back by adding even more activity. It’s easy to get complacent. I’ve been a distance runner for decades, usually walk when I play golf, almost always take the stairs at work, lift weights once or twice a week and take an occasional yoga class. But surprise: It wasn’t as much exercise as I thought. 10,000 steps a day? Pfff, piece of cake … not. I found I’d been overestimating my activity and had lots of room for improvement. Hmm, the mysterious holiday pounds might not be so mysterious after all. People will do anything to win a key chain. OK, that one’s not true. Yes, a company-branded lighted key chain is the only prize all but the top 4 or 5 people will win, but they’re not really participating for the prize. Rather, it’s all about the friendly competition and the challenge of seeing how well you can do. Many departments have their own internal rivalry going on — the top prize is barely on their radar. Fitness challenges can engage anyone. One of the most exciting things to me about this program has been the participation by the “non-athletes” among us. Evidence: We have walking workstations in a few locations around the building — treadmills with a place to plug in your laptop, so you can walk for 30 minutes while you’re on a conference call or checking email. Use of these workstations skyrocketed when the challenge was announced. Clearly, even people who had little chance of “winning” started stepping it up. Whether for better health or just to be part of a fun event, it really doesn’t matter. Of course, the real success of the challenge will be if people continue their increased activity long-term. It would be cool if teammates kept in touch and kept each other accountable. Maybe those intra-department rivalries will spark new competitions of their own. For me, I’m already thinking of ways to maintain at least some of the intensity and focus of the past month. I noticed Ash Wednesday falls just a few days after the challenge ends. So instead of giving up chocolate, I’m going to commit to at least 3 days a week of two-a-day workouts. There probably won’t be an LED key chain waiting in my Easter basket, but I think I’ve already seen the light. I’m on the up side of my on-again, off-again relationship with being active. Why is it so difficult to create a good habit? I want to work out. I want to be physically fit. I want a flat stomach, toned arms and thighs and a healthy heart, but why, oh why, do I not want a beautiful physique enough to work for it? There is room for improvement and it won’t happen unless I do something about it. I started a workout routine last week and I feel pretty good about it. I’m one week into it and hopefully this time there’s no turning back. If for some reason I fail at staying committed, I did get a good sermon illustration out of my efforts. Thanks, God. 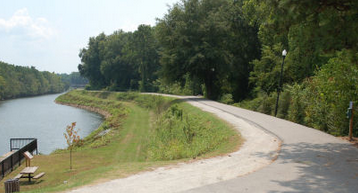 The on-again relationship started two Sundays ago when my husband and I hit the trail at Riverfront Park. I’m not sure how many miles we walked, but by Tuesday I could feel the wrath of that walk in the park. My muscles were sore! Instead of letting the soreness in my legs subside, I decided to keep working those babies. About an hour before dark, I made my way to the Statehouse to step things up a bit. I did laps around the iconic structure and jogged up and down the Statehouse steps twice. Twice? Yes, twice. I know you’re probably thinking, that’s nothing. Well, let me remind you that there are 52 steps that lead up to the door of our capitol building. At least I think it’s 52. Seems like each time I counted during my Saturday visit, I came up with a different number while making my way up or down. I guess that’s what happens when you’re tired – you can’t even think straight. And when you’re out of shape, 10 steps will have you panting. I do feel better about myself after my moderate work outs, but is that enough to make me stop flirting with exercise and finally commit to it? It seems like there’s always something that hinders me from maintaining a routine and excuses are high on the list. Let me see how many excuses I can come up with. I have too much homework to do. By the time I get home from work, I’m too tired. I’m not a morning person, so I can’t work out before going to the office. And any other excuse I can come up with on given day. I need you to cheer me on and be my accountability partners. Do you have a routine that works? How do you stay committed to being physically fit? I’d love to hear from you. In the meantime, I have a work out to complete. I’ll be back here at the end of August. In some of my past blog entries I have focused on the benefits of moving our bodies. Whether for our mental or physical health, it’s just a no-brainer that physical fitness is good for our bods, inside and out. To me, it has always been a given that when done correctly, any physical fitness can be beneficial. Until recently, though, I never understood just how beneficial it can really be. For any of you who have read my blog entries or know me personally, you know that one of the things I do with my busy life is instruct Zumba. Being a Zumba and Aqua Zumba instructor is how I attempt to stay in shape and keep my heart healthy. Plus, my commitment to teaching helps to hold me accountable to moving my body in the first place! If I did not have to be at the gym to instruct a class, I would stay too busy to ever take the time to actually work out. What I did not consider when I started instructing these classes, was the incredible mental benefits that would come with the exercise. I am a true testament to the fact that moving your body on a regular basis can help you deal with stress. Over the past couple of years, my life has been overwhelmed with stress and change – mistakes, life lessons learned, enormous challenges, and a constant journey for strength, faith, hope and forgiveness. Heaven forbid life is ever easy or we make all the right decisions, eh? Let’s just say, I’m quite surprised I have any sanity left at all! But I can say with confidence that the physical activity I get through instructing Zumba is one of the main things in my personal life that has kept me from going off the deep end. All that being said, I recently came across a fabulous article in Health Magazine, which focuses on the fact that a good workout can indeed be the best medicine for a whole lot of things! This particular article touches on challenges ranging from lower back pain, to hot flashes, to dealing with a racing mind, and then gives real fitness solutions to target each problem. Some workouts are better than others in fixing different problems. If you have a specific, or several ailments, I can almost guarantee that there is probably some sort of fitness exercise out there that can specifically target your problem. 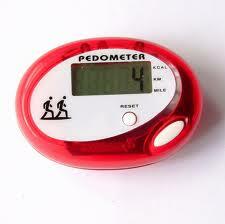 You just have to take the time to do the research and find your personal fitness fix-its. As I’ve mentioned before in one of my blog entries, which I’m very proud of, it’s a great idea to add a mental health check-up to your “To-Do” list. As a society, we tend to put such an enormous focus on our physical state instead of on our mental state. Let’s face it – looking healthy on the outside is no guarantee that you’re healthy or happy on the inside. And the truth is, they go hand and hand. Our physical and mental wellness partner together, whether we want them to or not! If we just remember to recognize how the two work together, we can see both day-to-day and long-term benefits. Research proves that our self-esteem soars when we work out. I can certainly attest to that on many levels. I can walk into the gym dreading having to teach a Zumba class because I’m so stressed out, feeling hopeless and wonder how I’ll ever make it through the first song, much less a whole hour of leading a class. But, it never fails. I walk in to see the amazing, smiling faces of these precious people eager to move and have fun and I’m given the strength to step up to do my job. And then low and behold, the more I move, the more endorphins run through my body, resulting in a return to sanity. A sweet release occurs when you get a good workout. I walk out of each class with a renewed sense of self, physically and mentally. I have even discovered that on those lovely days when I’m battling intense monthly period pains and the last thing I want to do is move, the workout I get while teaching a Zumba class ALWAYS makes me feel better. It never fails. I can walk into a class wondering if I will be able to move adequately due to the menstrual war raging within my body, and then I walk out refreshed and amazed that the cramps have subsided. It literally feels as if I danced a bit of peace into my insides. Crazy, but it works every time! I can certainly say that I have discovered how I can fix some things with fitness. It may not be a magical cure-all that will always keep stress away or keep me from having a period, but it darn well helps keep the stress and pain at bay, and contributes to helping me stay somewhat securely strapped into the roller coaster ride that is my life. Don’t forget to add that mental check-up to your “To-Do” list! Check out the Health Magazine article and check out some of the fitness solutions to some everyday health problems. And by all means, do your own research and make an effort to discover what workouts can help fix your ailments! 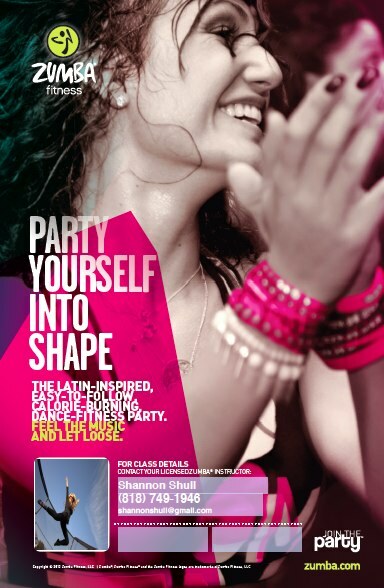 Throw Down & Party Yourself Into Shape! Ok, yes, I admit, I’m hoping the title of this blog entry caught your attention! Am I talking about drinking or drugging yourself into some kind of party oblivion? Of course not! I’m actually talking about the positive effects of engaging in a Zumba dance party! Let’s face it though, if I had titled my blog entry simply as “Zumba Dance Party,” I’m not quite sure you would’ve clicked to read on. So in an attempt to get and keep your attention, I’d like to share with you how Zumba has richly affected my life and helped to keep me and my ole’ bod in shape. 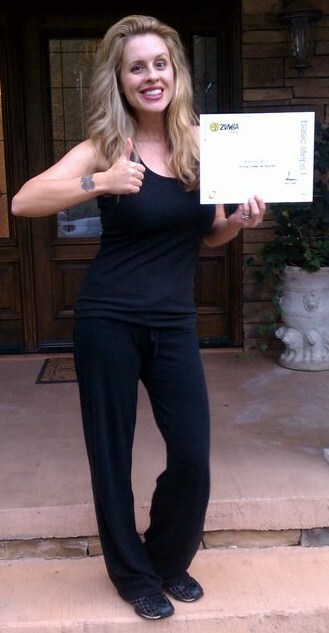 Zumba Shannon – November 2010, when she 1st got licensed as a Zumba Instructor. Since then she’s lost 15 lbs & gained muscles she never knew she had! I’ve been licensed to teach Zumba since November of 2010 and just recently got licensed to teach Aqua Zumba this past July. I’ve taught and led Zumba fun at everything, ranging from birthday parties to Mary Kay parties to Leisure Centers and dance studios. I’ve recently started teaching for all the Gold’s Gym locations of the Midlands of Lexington and Columbia, SC and am thrilled about it. The Zumba craze has indeed been fierce and fabulous. But why did it attract my attention? Yes, I am a dancer – a theatre/dance college grad and teacher of the arts – so I love just about all things that involve music and dance. I also have a degree in Fitness & Nutrition from way back, but I have to admit, I’ve never been a dedicated gym-going type person, and regular aerobics classes quite honestly bored me. I have never in my lifetime been able to truly commit to a regular aerobics/fitness class! …That is until Zumba came into my life. Now let me clarify – as is the case with anything, whether it’s any teacher, preacher, trainer, coach, etc. it’s all about personal preference. The very first Zumba class I took did not impress me that much because the teacher was too intricate and complicating with her moves and teaching style. I walked away saying, “Oh well, I guess that Zumba thing isn’t for me.” Then I gave it another chance and took another class with a different Zumba instructor….and it was amazing! Love at first groove! For me, the right teacher made all the difference in the world! This particular teacher kept the moves simple, allowing for the class to really get into the groove and experience a dance party while getting a great workout. She was wild, goofy and provided total fun! My kind of teacher, my kind of class, my kind of work out! I walked away from that class going, “I could do that!” Right then and there I decided that I would dedicate time to getting licensed to teach Zumba. I mean the reality was, if I was going to truly commit to getting into shape and enjoy actually getting paid to do it, I would have to become an instructor! I knew myself well enough to know that I needed something to hold me accountable to getting in shape and by being an instructor…well, I’d have to attend every class! Between my love for music, dance and choreography, teaching Zumba has been the perfect life experience for me of having a darn “healthy” good time, participating in weekly dance parties, flat out throwing down and best of all…getting into the best shape of my life! What do you do to truly have physical fun in your life? Do you work out? If so, do you have actual fun working out? Like I tell all my Zumba students, you absolutely do NOT have to be an experienced dancer or fitness nut to get into Zumba and experience the positive effects of the Zumba dance party. If you love music, if you love to move – whether you have any rhythm or not! – if you have the right instructor for you, you will absolutely LOVE Zumba. Whether on land or in the water, your body will thank you for letting it experience the joys of Zumba fitness! If you live in the Midlands area, come check out my Aqua Zumba classes on Thursdays at 10:15 a.m. at the Gold’s Gym Columbiana Point location. And starting in September I’ll be teaching regular Zumba classes on Wednesdays at 8:15 a.m. and Fridays at 6 p.m. at the Gold’s Gym Columbiana Point location too. If you’re truly interested in partying with me, feel free to email me and I’ll update you on any other classes I may be teaching! I’ll be adding more classes in the future and am often subbing for other teachers! Check out the following links and join in on the Zumba Dance Party Fun! Let’s throw down – healthy, super groovin’ style! If you watch anything, watch the 1st video below. It will inspire you and make you smile for sure! The 2012 London Olympics is finally here! 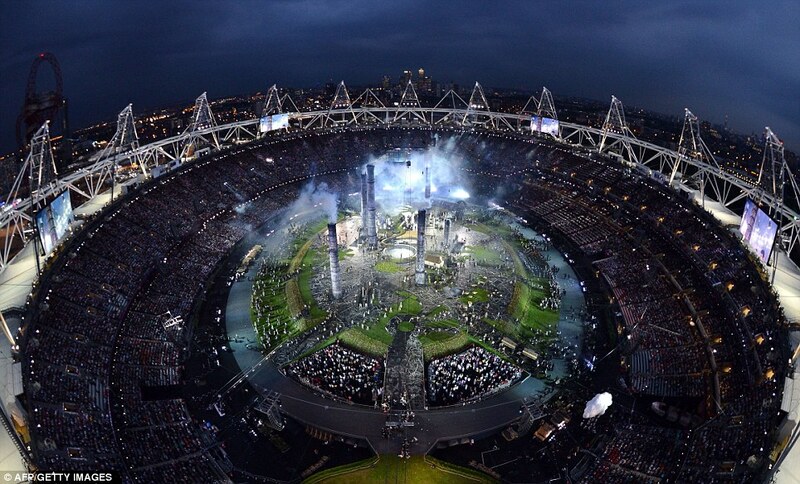 Did you watch the opening ceremony and if you did, what did you think? I loved every minute of it! I held off going to the bathroom or getting something to eat/drink as I didn’t want to miss anything.. (I know, I could have DVR it, but then I would have been up even later as my bed time is around 10pm 🙂 ). 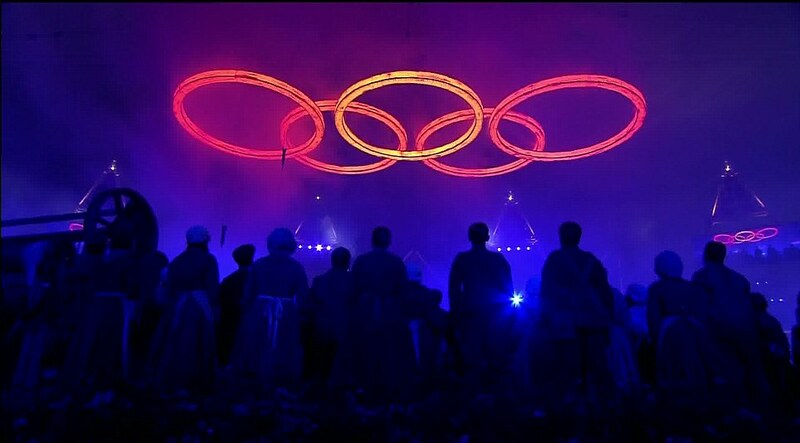 I especially liked the set transitions from the British meadows to the industrial revolution, which built the Olympic rings that were raised above the stadium. Impressive! 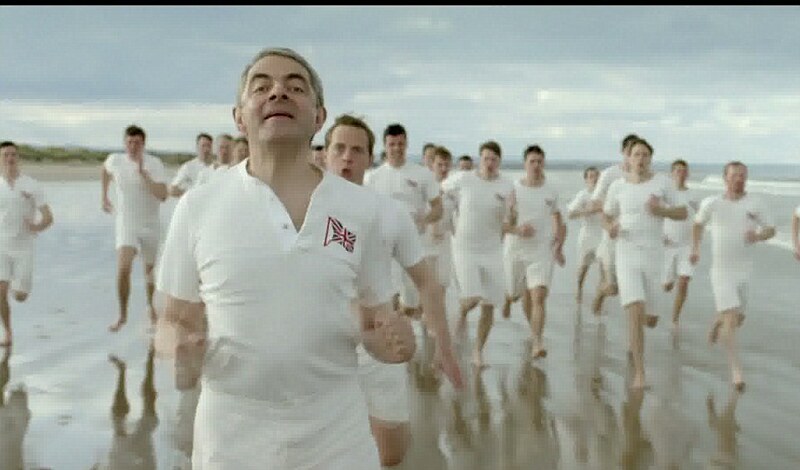 Then, to see Mr. Bean as a member of the orchestra as they played, “Chariots of Fire,” which led into him racing in a scene from the movie – priceless! 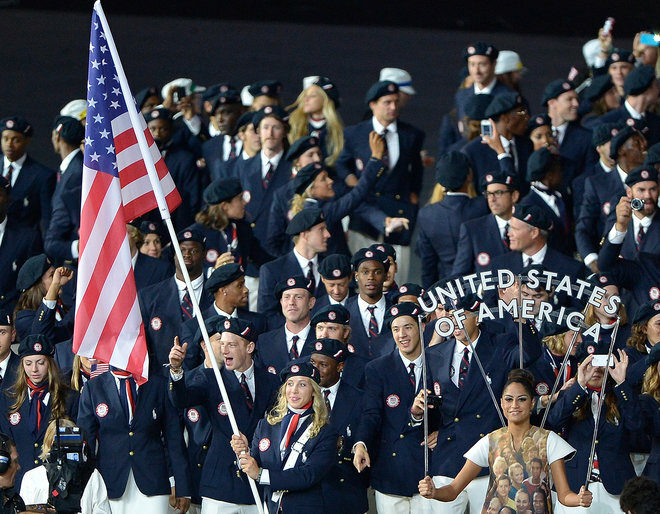 The part that I struggled to stay up for was the United States team members make their walk into the stadium. It’s one of the few times I wished our country’s name started at the beginning of the alphabet. Haha. Actually, I found it interesting to see the different countries participating and how some only had a few attending on behalf of their country. Then we walked in with so many representing our country and it made me proud to be an American! I have been glued to my television ever since, watching as many events as I can and catching up on sleep missed on the weekend 🙂 Where else can you watch beach volleyball, swimming, soccer, water polo, gymnastics, table tennis and synchronized diving while spending quality time with the family?! That’s what makes the Olympics great – there are so many events to choose from! It makes for great discussions around the water cooler and predictions of event finals yet to come. The Olympics is where memorable moments are created. A time when we can forget about our troubles, focusing our attention on cheering our team to the finish line. I wish the Olympics would come around more often as I think it would serve as a reminder that with a positive attitude, hard work and determination, you can reach anything you set your mind to. Thank you to all those representing the United States in London as you have sacrificed a lot and are making a difference, inspiring many! What events do you like to watch? What has been your most memorable moment of the 2012 London Olympics?